Some retail versions use Tages DRM, which isn't completely compatible with modern OSs and systems. 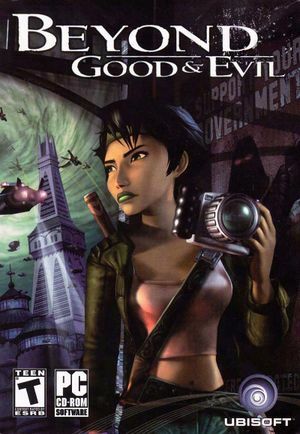 The GOG.com version has been modified to work with modern systems through the inclusion of a multi-thread wrapper. Patch v1.01 updates the game to the latest version. sally.idx contains an index of save game names which will not be shown if it is missing (saves can still be loaded). Unknown type. Forcing externally may or may not work. 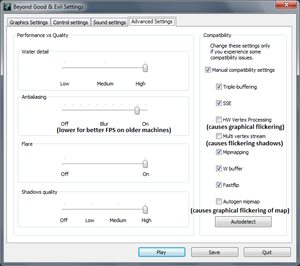 Forcing anti-aliasing through your graphics card control panel will result (at some point during gameplay) in black screens, or corrupted graphics. Extract bge.7z files to the installation folder (password: bge). 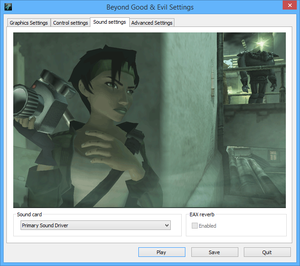 Edit bge.ini to set the resolution, pillarbox, and FOV. Supported exe size: 7,778,304 bytes (GOG.com/Buka version), 7,819,264 bytes, 7,489,200 bytes (Uplay version). Does not work with Steam version. Open d3d9.ini and set your resolution, then save your changes and start the game. If the game shows an error message go into the Redist folder and run DXSETUP.exe. If the game fails to launch with this fix, run CheckApplication.exe in Windows XP SP3 compatibility mode. Because the game is internally rendered in a 16:9.4 aspect ratio instead of 16:9, you will see some very small borders on both sides of the game when playing in 16:9. Y and X axis cannot be toggled individually. Uplay versions only. XInput only. Polish retail version only. Additional patch from publisher fixes a bug in the localization that makes the game unable to progress normally. Alt+Tab ↹ support is disabled by default. MSI Afterburner's screen capture also does not work by default. Rename BGE.exe to something else. Create new shortcut to that .exe or run it directly. If you're already using external software to limit the frame rate or change other settings, don't forget to add the renamed executable to that software's profile as well. Tick all the boxes except "Autogen mipmap". 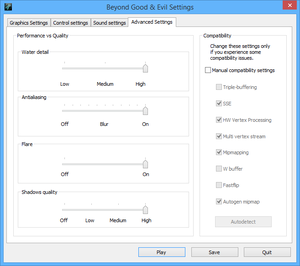 The optimal settings for maximum modern system compatibility with the game (Method 1). Untick "HW Vertex Processing", "Multi vertex stream", and "Autogen mipmap". For most people simply disabling HW Vertex Processing works flawlessly, however this usually slows down the game badly even on high-end machines, which is why some prefer the second method. If this doesn't work completely (some flickering still remains), the anti-aliasing can be forced (see Anti-aliasing (AA)). Set BGE.exe to compatibility mode for Windows Vista SP2. If you are using a Steam Controller, do not select Windows XP SP3 or older, as this prevents the Steam Overlay from hooking into the game and mapping the controller correctly. 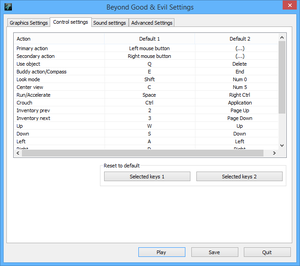 With this setting, you can also re-enable anti-aliasing. If you have an Nvidia card, go to Nvidia Control Panel and change "Maximum pre­rendered frames" to 1 for BGE.exe. This should remove flickering without performance penalties. "Manual compatibility settings" of the game should be left default. If there are problems with the sound not syncing up with the picture. Click on the "Sound settings" tab. Set SettingsApplication.exe to compatibility mode for Windows XP SP3. This tool can patch save games to work around a number of common glitches encountered in the PC version, including glitches in the 'Central Hall' area, and the triangle key not falling from the vent after defeating the bots. Download and run BGAE Fix. Go to the Sound tab, enable EAX Reverb. ↑ 1.0 1.1 File/folder structure within this directory reflects the path(s) listed for Windows and/or Steam game data (use Wine regedit to access Windows registry paths). Games with Steam Cloud support may store data in ~/.steam/steam/userdata/<user-id>/15130/ in addition to or instead of this directory. The app ID (15130) may differ in some cases. Treat backslashes as forward slashes. See the glossary page for details. This page was last edited on 5 March 2019, at 00:11.